Warner Bros. has released the second trailer for their highly-anticipated Tomb Raider reboot, which hits theaters in just under two months. 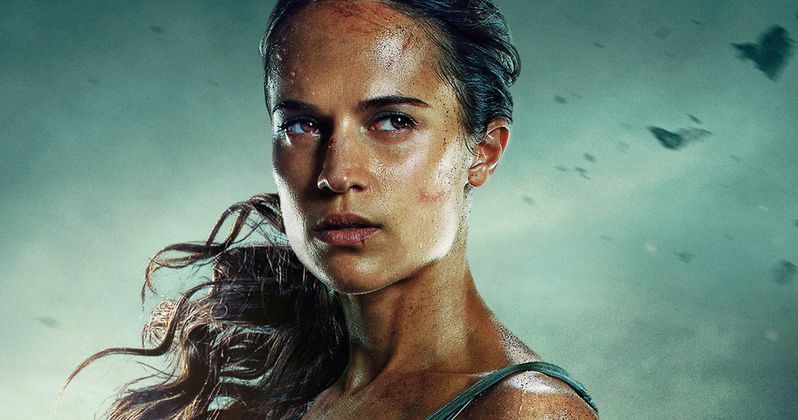 This trailer comes just a month after we saw new photos of Alicia Vikander as Lara Croft, along with Daniel Wu's Lu Ren, and nearly four months since the first footage arrived. With the March 16 release date getting closer and closer, hopefully this trailer is just the first of much more footage to be released in the next two months. Given the massive popularity of the video game series, it's not terribly surprising that this reboot has already been somewhat controversial. Fans took to social media in September to slam the first poster since it appeared that Alicia Vikander's neck was elongated, for whatever reason, which lead to a string of parody posters surfacing on social media. The second poster released in December took a much different approach and avoided any social media controversy, although there is no indication as of yet as to whether or not there will be a new poster alongside this trailer. Tomb Raider is the story that will set a young and resolute Lara Croft on a path toward becoming a global hero. The film stars Oscar winner Alicia Vikander (Ex Machina, The Danish Girl) in the lead role, under the direction of Roar Uthaug (The Wave), with Oscar-winner Graham King (The Departed) producing under his GK Films banner. Uthaug directed from a script by Geneva Robertson-Dworet and Alastair Siddons. The executive producers are Patrick McCormick, Denis O'Sullivan and Noah Hughes. Tomb Raider also stars Dominic West (Money Monster, 300), Walton Goggins (The Hateful Eight, Django Unchained), Daniel Wu (AMC's Into the Badlands) and Oscar nominee Kristin Scott Thomas (The English Patient). Tomb Raider is set to hit theaters on March 16, 2018, the film will be distributed by Warner Bros. Pictures, a Warner Bros. Entertainment Company, and in select territories by MGM. This movie has the chance to make history and become the highest-grossing video game movie at the domestic box office. Back in 2016, Warcraft became the highest-grossing video game movie at the global box office, although it did so while flopping at the domestic box office, with the 17-year record of $131.2 million set by the original Tomb Raider starring Angelina Jolie, still standing. This adaptation is based on the more current video game series which rebooted the Lara Croft character and followed her on her first ever adventure, the story we'll see unfold on the big screen. Take a look at this new trailer below, courtesy of Warner Bros.